2011 has proved to be a year that we don't ever want to repeat, however we have grown so much in this past year. We learned more in one year than we have ever learned all together. We learned who our true friends and family were and are and those that left our side. But most of all we watched our daughter go through complete torture and smile through it all. Emily is our hero and she is so strong. Emily we love you so much! But most of all, for the year of 2011, we learned... "You never know how strong you are until being strong is the only choice you have." This past week a family that we met while in Philadelphia that also lives in Virginia whose daughter has Neuroblastoma, The Kudro's, Hayley lost her fight to neuroblastoma. Karen and Eric, Doug and I just want you to know you are amazing parents and Hayley is a beautiful little girl. All we remember is the night we drove to the RMH and you two were waiting outside for us and she was waving her hands all over and just so excited. We are sending lots of love and prayers to you! This year was also one of the hardest year that we have ever had. December 18th marked one year since this journey began and December 23rd marked one year since we learned that our daughter, Emily, has (that dreaded word) cancer, neuroblastoma to be exact. A cancer that is hard to beat. The loss of Hayley was a lot harder on us than we ever imagined, because it just feels so close to home. But we also know that Hayley is no longer in pain and for that we are grateful.! This past year has been a journey that Doug and I have learned to do many things on our own because there hasn't been much help, learned to cope with something that I never thought we would have to deal with and continue to move forward with the rest of our family while working. While I don't want to bring a sad post tonight, I just want to say we are thankful that we were all home together as a family for Christmas Eve and Christmas Day and here we are, its New Years Eve and we are all home together again. For that we are very thankful! Right now we head back to CHOP on January 9th for an MIBG on the 10th and results on the 11th. The results we are hopeful that they are showing improvement and if they are, then we move forward and will be placed inpatient to start Round 2 of MIBG Therapy. If the scans do no show improvement, they have some other thoughts for us. Scanxiety is surely in our minds, but we are remaining positive that there is improvement.. Emily has had 7 platelets transfusions since we have been home and 2 blood transfusions. For the first time, Thursday, Emily did not need to have a platelet transfusion and we are hopeful that they are coming up and staying up on their own. Emily has clinic Monday morning, so we will see how things are. 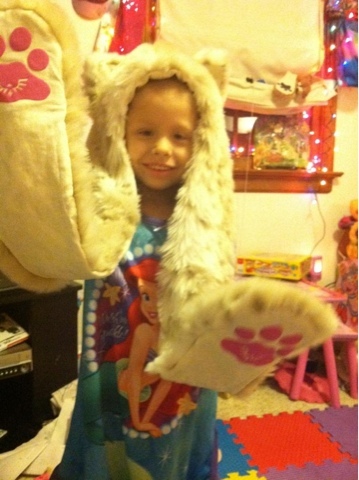 As the year comes to a close, and we start 2012, we are looking for a much brighter, happier and healthy with CLEAN scans! Happy New Year Emily!!! Your the strongest little girl I have ever met. Your bravery is something I wish I had at times. When I have a bad day I click on your page and see that pretty smile, which always warms my heart. Whatever 2012 brings~know that I will always be following your journey. Lots of love and hugs. I love Emily's hat in that picture! I am so happy you guys got to spend the Holiday's at home together, Heres to good news in 2012 :) Happy New Year! Happy New Year!!! Much love to you all and I am so glad you were all home for Christmas. I will keep Hayley's family in my thoughts and prayers. As frightening and sad Emily’s Story is, your ability to share with us in such a manner of hope and faith amazes me. You allow all of us to feel, as much as we can, your personal pain as a family. Have you considered writing her story for publication? If you recall, I wrote of my daughter’s illness at the age of ten with a kidney disease. To refresh you, my daughter was diagnoses as fatal. Prayers I know made the difference between giving in to this prediction or frightening for her life. Jan 24th she will be 32, married with two children. I hear your faith and strength in every word you write and I believe Emily’s Story will benefit many other parents facing such a horrible hell as you are. This can also prove a monetary need I am sure you worry about daily. One other note: Has anyone from the Make a Wish foundation have any contact with you ? With us, two sources contacted Make a Wish to share our story and we were given the most wonderful vacation to Disney. It gave us the chance to leave reality for a while and just enjoy each other and have FUN. Our doctor and a teacher nominated my daughter. If you have any other questions or just want to chat let Lynn know and she will give you my number. Emily keep smiling and teaching us how to fight.